Has your print budget virtually disappeared in this age of digital media? Don’t despair. Online e-newsletters and e-publications are here to help. Join the trend and you will see how quickly you become a believer in online media. 1) save money. No longer do you have to worry about print, mailing and distribution costs. Yes, there are programming costs but these are usually quite a bit less than printing, postage and fulfillment. 2) have the world as your audience. Your newsletter has the potential to reach people around the world. No longer do you have to confine your readership to just your mailing list. 3) publish content that is up-to-date and current. You can get the information out quickly and keep it current with regular updates or supplemental articles. No longer do you have to wait for the printer and “snail mail” to distribute content that in many cases is weeks old. 4) link to other valuable web sites. You can easily provide links to other web sites, resources pages, videos and supplemental articles. The ability to provide content that is more dynamic and leads to supplemental contest is a great asset of online publications. 5) use full-color photography and graphics. Unlike print, there are no budget constraints in terms of color. No longer do you have to stick to just a 1- or 2-color newsletter just because the boss is leaning on you to stay within budget. Go ahead. Go crazy with color! 6) use low-resolution and low-cost photos. No longer do you have to hound your clients for high-resolution photos. Photos taken at 72 dots per inch (dpi) are sufficient quality for the web. But that does not mean that you should use blurry or poorly composed shots. You will still need to discriminate in terms of the photos you select. 7) provide content that has a long shelf-life. E-publications are easily searchable on the web. Unlike printed copies which may run-out after distribution, readers can keep on accessing the content years later, especially if it is properly cataloged and is easily searchable. 8) create teaser articles. These are snippets of articles that allow the reader to click on a link to read the entire article. Readers can more quickly and easily scan the e-newsletter or e-publications for articles of interest. The ability to navigate content quickly and to read a synopsis of the content is a great benefit of online publications. 9) add interactivity. With the right tools you can add video, animation, hotlinks, iframes, voiceovers, flipbooks, pop-ups, tweets and a blog to your e-publication. 10) quickly test how your publication will look before it is sent out. Unlike printing, the beauty of the Web is that you can test files to see how a publication will look when it is posted. You can easily and quickly make changes without reprinting or costly changes on press. For many years, we have been designing online e-publications for our clients. 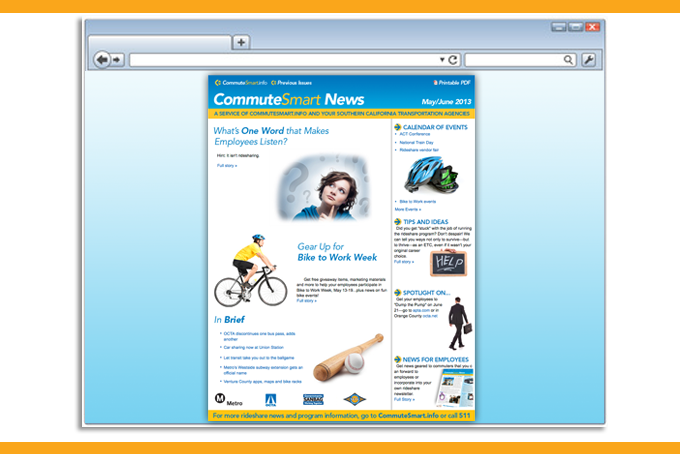 One of these is CommuteSmart News, a Southern California regional e-newsletter that provides valuable information to employers and employers about commuter alternatives to driving alone. 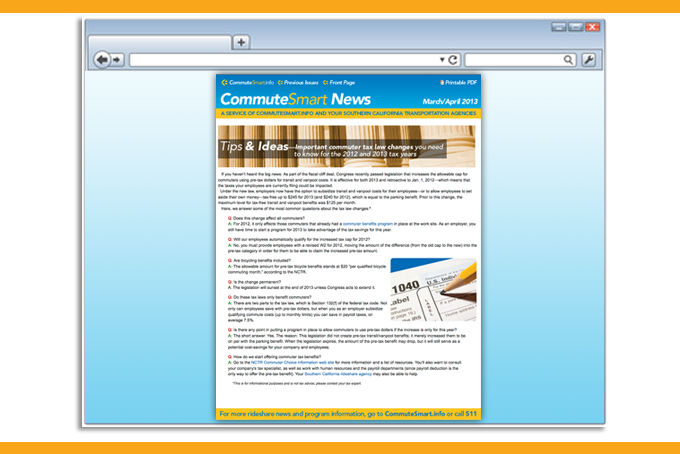 CommuteSmart News is the longest-running rideshare newsletter in the nation. This monthly publication is jointly funded by five Southern California transportation commissions including Metro, OCTA, RCTC, SANBAG, and VCTC. 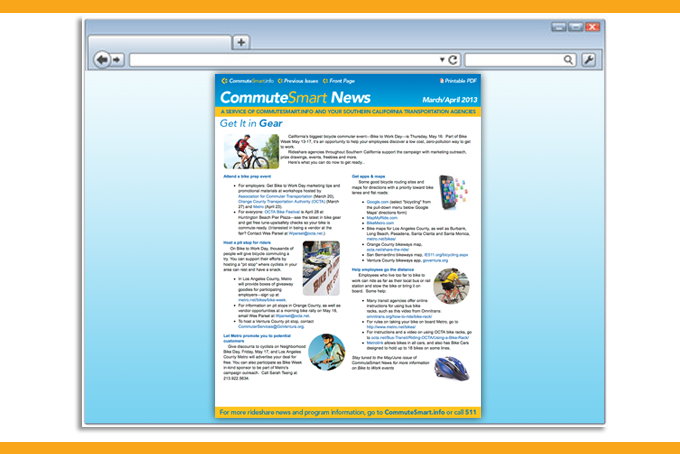 It provides information about commuter alternatives, particularly the use of public transit, ways to save gas and other incentives for commuters who wish to “share” the ride, bicycle or walk to work. 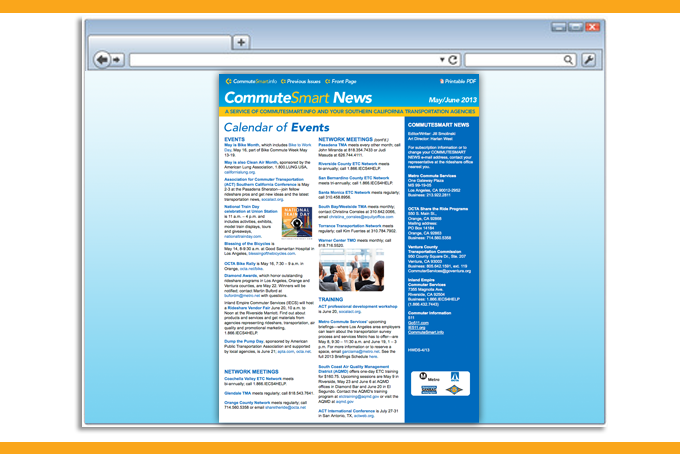 Each month, the front page is sent out as a teaser or e-blast through e-mail using XHTML coding. Each snippet or blurb on this main page links back to a complete article which exists as a web page and is stored on a server. Please see sample below. Secondary pages consist of full articles that often include links to external URLs and resources pages. Please see samples below. Finally, a calendar is a great way to promote conventions, seminars, training sessions, workshops, networking meetings and special events Please see sample below. To find out more about how we can help create an e-newsletter or e-publication for your firm or organization, contact HWDS at hwdesign@west.net. Get going and get online! Please note: All projects displayed on this blog are meant for educational and instructional rather than promotional purposes. We respect our clients’ brand integrity. This entry was posted in Corporate Communications, E-publications, Marketing Campaigns, Newsletters, Online Communications, Successful Corporate Communications and tagged Arts, Business, design, E-blasts, E-publications, Google, Harlan West, Southern California, successful corporate communications, United States, Web Design and Development by Successful Corporate Communications. Bookmark the permalink.